American MotoGP fans have likely already surmised from the 2016 MotoGP Championship provisional calendar that the premier motorcycle racing series will not return to Indianapolis Motor Speedway next year, thus leaving Austin as the sole American round on the GP schedule. The move comes about primarily because Indianapolis Motor Speedway (IMS) did not want to pay Dorna’s sanctioning fee, which had increased for the 2016 season. 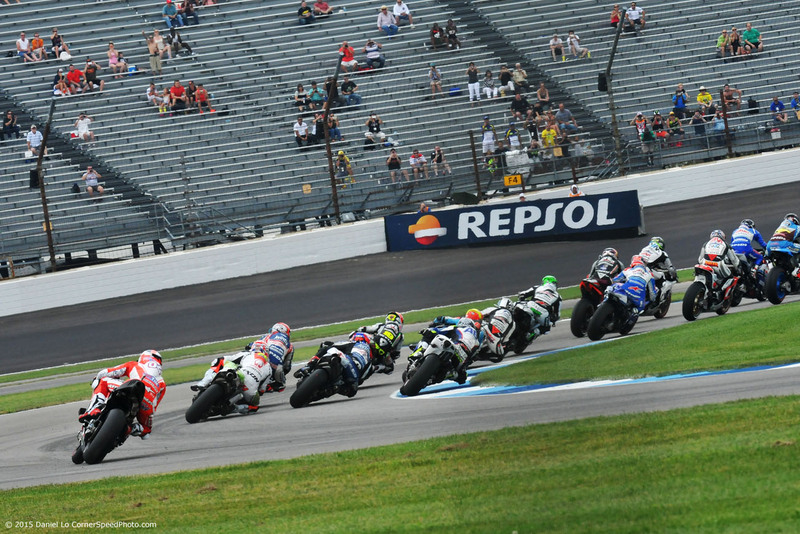 Though IMS plays host to many of the world’s premier racing events, MotoGP will no longer be one of them. The FIM today released a provisional calendar for MotoGP in 2016, featuring much that was expected and a few surprises. The calendar will once again have 18 races, with Indianapolis dropped and Austria taking its place. The biggest change in the calendar is the moving of the British Grand Prix at Silverstone, which vacates its late August slot for the middle of July. That move, and the scheduling of Austria and Brno back to back, will not be popular with the circuits. The British MotoGP round comes just three weeks after the F1 race at Silverstone, due to be held at the end of June. Silverstone will fear that having the two biggest events of the year in the space of a month will mean that they cannibalize attendance, with spectators choosing to attend either F1 or MotoGP. When there were two months between the two races, the chances of fans attending both were greater. I’m not gonna lie, we sorta dropped the ball when it came to sharing with you the 30th anniversary livery that Team Suzuki Ecstar is rocking in MotoGP. If anyone asks, it’s all Tony’s fault. Totally on him. Like, for reals…all Tony. Bad Tony! Bad! While Tony works on a personal apology note, hand-written naturally, for each and every one of you, we’ve got a small collection of his photos from Sachsenring and Indianapolis of Suzuki’s tribute to the GSX-R line. We think it’s pretty fetching, which only adds to the fact that the Suzuki GSX-RR MotoGP race bike is one of the best looking machines on the grid. I actually had a dream about it last night…I’m not ready to talk about it. Photos after the jump, ok? Enjoy! And Tony, I want those notes on my desk by Monday. Chop! Chop! Is The Honda RC213V-S Really Your Dream Bike? Roughly four years ago, I wrote a story called “The Chrysanthemum and the Sword” that implored the Japanese motorcycle manufacturers to build elements into their brand that went beyond the tangible and into the intangible — I was basically asking these brands to create what motorcyclists call soul. From that story, I got a number of insightful emails from employees at these Japanese brands, who shared my frustration with the soulless machines their employers were creating. Despite those emails, when the Honda RC213V-S debuted, I was struck by how extensively that message had fallen on deaf ears. The day of the RC213V-S’s launch, I asked my Facebook followers if the Japanese brand had “just pulled a Honda” on its release Honda RC213V-S – debuting a machine that ticked all the right objective boxes, but failed the most subjective of all tests: my lustful desire to own it. This is part two of our Indy round up, covering the excellent Moto2 race, and the intriguing Moto3 race. If you want to read about MotoGP, see part one. The Moto2 race turned out to be a barnstormer, a welcome return for the class. Once, Moto2 was the best race of the weekend, but in the past couple of years, it has become processional, and turned into dead air between the visceral thrills of Moto3 and the tripwire tension of MotoGP. At Indy, Johann Zarco, Alex Rins, Franco Morbidelli, Dominique Aegerter, and Tito Rabat battled all race long for supremacy. They were joined at the start of the race by a brace of Malaysians, Hafizh Syahrin running at the front while Azlan Shah fought a close battle behind. Sam Lowes held on in the first half of the race, but as he started to catch the leaders in the last few laps, he ended up crashing out. In the end, it was Alex Rins who took victory, just rewards for the man who had been the best of the field all weekend. It was Rins’ first victory in Moto2, and confirmation of his status as an exceptional young talent. 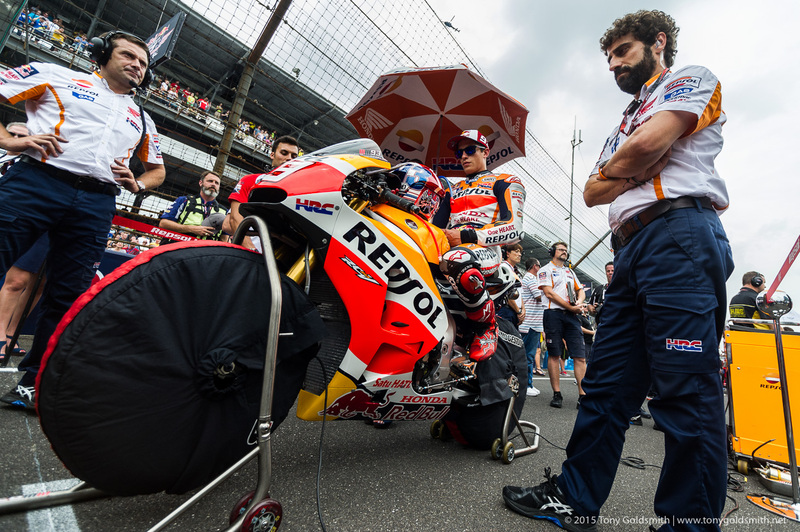 Whether this is the last time MotoGP visits Indianapolis or not – the lack of an announcement on Sunday night suggests that this was the last time – the 2015 edition will certainly go down in history as memorable. Race day saw the biggest crowd since 2009 head to Indianapolis Motor Speedway, though in a facility this vast, anything less than a quarter of a million fans is going to look empty, and all 67,000 were treated to some genuine racing spectacle. An upside down Moto3 race, where those bold enough to gamble on slicks were duly rewarded; an old-fashioned Moto2 dogfight, where a group of evenly matched riders brawled from start to finish; and a pair of exceptionally tense duels in MotoGP, with championship positions raising the stakes even further. The race of the day? Hard to say. All three had their own appeal. Rain and a drying track made Moto3 a weird contest, with massive gaps between the leaders, and yet still strangely exciting, because of the potential effects on the championship. Moto2 harked back to the halcyon days of Márquez, Iannone, and Espargaro, and reminded us of why we used to love the class. And MotoGP was more about tension than straight up excitement, brains kept busy calculating the ramifications for the championship as the front four swapped positions. That Marc Márquez ended up winning the MotoGP race should come as no surprise. The Repsol Honda rider extended his winning streak, both at the track and in the USA. I’ve shot from the grandstands every single year since MotoGP started racing at Indy in 2008. I almost didn’t do so this weekend, but towards the end of the race most riders were too spread out for group photos so I autopiloted back to my favorite vantage point. Peering through a lens sometimes makes you oblivious to what’s happening right in front of you. I didn’t realize until well after the fact that Andrea Dovizioso had just gotten bumped off line and ended up last barely two corners into the race. Park ferme is an ideal place to capture portraits of riders in a reasonably good mood. Valentino Rossi once again recovered from a poor qualifying position to finish on the rostrum. 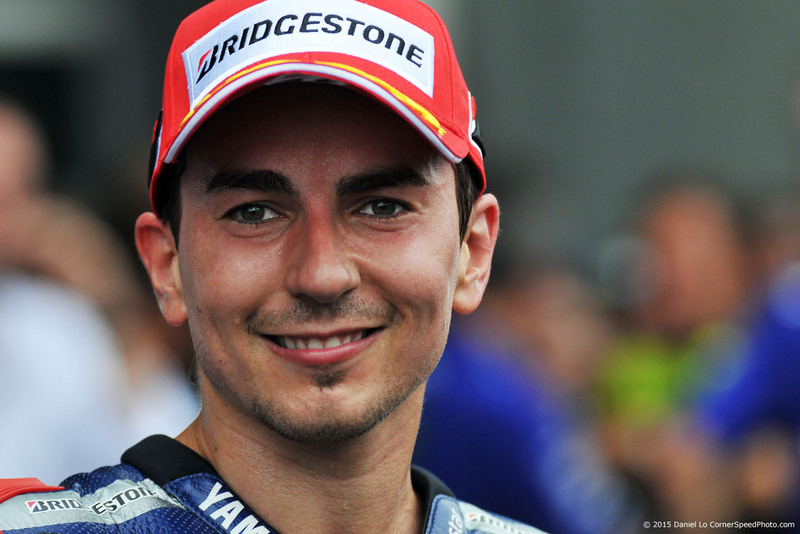 Jorge Lorenzo lead for most of the race but had to settle for 2nd place behind Marc Marquez. Marc Marquez can’t stop winning on American soil. He clearly enjoys racing in the USA. 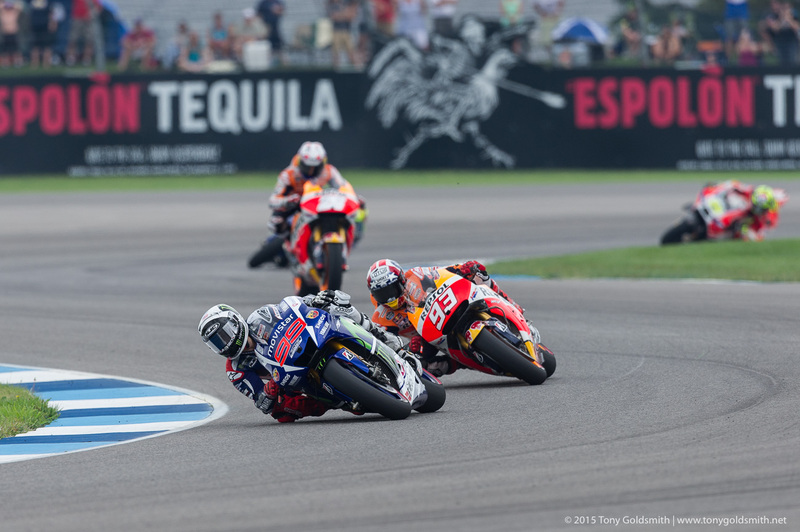 After practice on Friday, it looked like the MotoGP race at Indianapolis was going to be a knock-down, drag-out battle between Marc Márquez and Jorge Lorenzo, both men very evenly matched. A day later, and it looks like the battle could be much bigger than that, with Dani Pedrosa and Valentino Rossi on the same pace, and maybe even Pol Espargaro, Bradley Smith, and if things go right for him, Aleix Espargaro involved in the fight. Unfortunately for the fans, the battle will be for second, as one man has moved the game on. Marc Márquez’s reign in the USA is looking increasingly secure. Every once in a while, riders inadvertently do me a big favor by glancing over as I’m taking pictures. Eye contact is always a bonus. This was a continuation of an idea that I started trying a couple years ago, but I forgot about. I tried to use the track to add a bit of interest to the foreground, while making sure the rider was making an interesting shape. 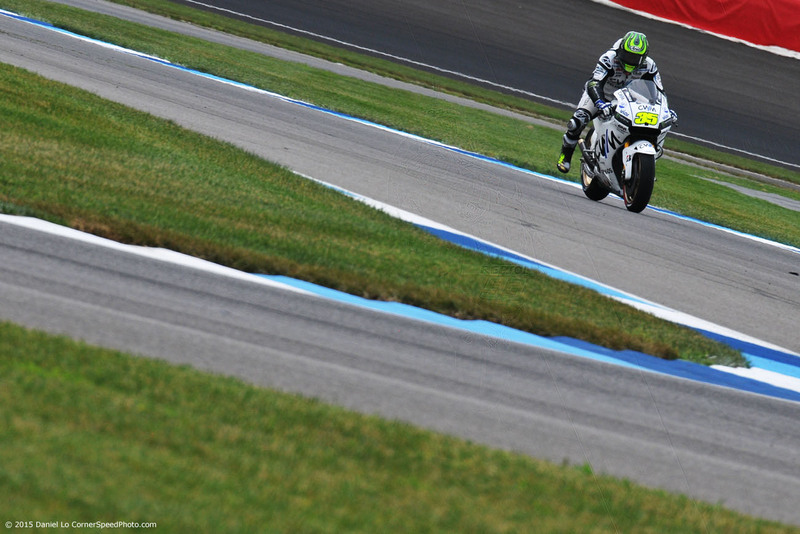 Cal Crutchlow was the only rider to dangle his leg, making him the ideal subject. 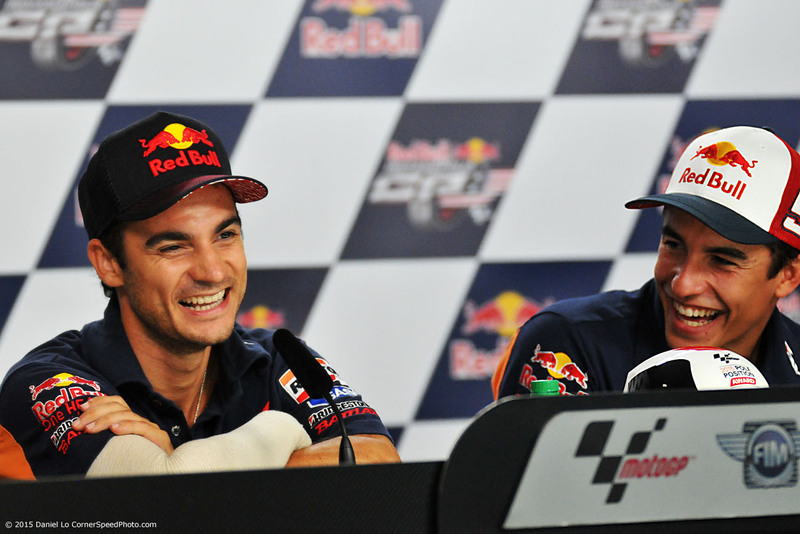 This is what happens when riders are asked silly questions during press conferences.